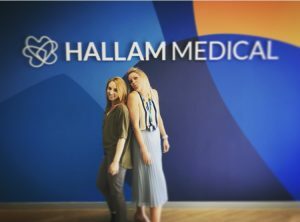 On Sunday two members of the Hallam Medical team are running the Sheffield half marathon. We would love to wish our Brand and Marketing Manager, Elizabeth Taylor and Recruitment Consultant, Francesca Boulter the best of luck in this 13.1mile race. Both Liz and Frankie are taking part in this event to raise money for their chosen charities. Liz is raising money for Imogen’s Dream Charity and Frankie is raising money for The Children’s’ Hospital Charity, Sheffield, both causes are very close to their heart. In December 2015, Liz could barely walk and was diagnosed with a spinal tumour and told she would never regain full use of her legs. However, a miracle did happen for Liz, the tumour was successfully removed with no side effects and she regained full use of her legs with no permanent damage. Liz is an inspiration and always pushes herself to achieve the best she can be. Liz is running the Sheffield half marathon to support the charity Imogen’s Dream – a charity set up by the step-daughter of our HR and Office Manager Julie Ellis. Julie’s step-daughter Imogen was diagnosed with Ewing’s Sarcoma in 2016, an aggressive bone cancer. Sadly Imogen lost her battle to cancer in October 2018. Imogen’s dream charity was set up in order to help other families to have family time and make memories to cherish, just like she did. Francesca wanted to challenge herself as the gym was just getting a little boring and this was something, she had been keen on taking part in the Sheffield half marathon for a while. Frankie has always enjoyed running but the furthest she has ever run was about 3 miles, so 12 miles will be a massive challenge! And as Sheffield is the hilliest place ever, she thinks if she does this half marathon, she is sure she can do others. Frankie is also running to raise money for Sheffield Hospitals Charity, this charity helps adults, children and babies being treated in all the hospitals in Sheffield.